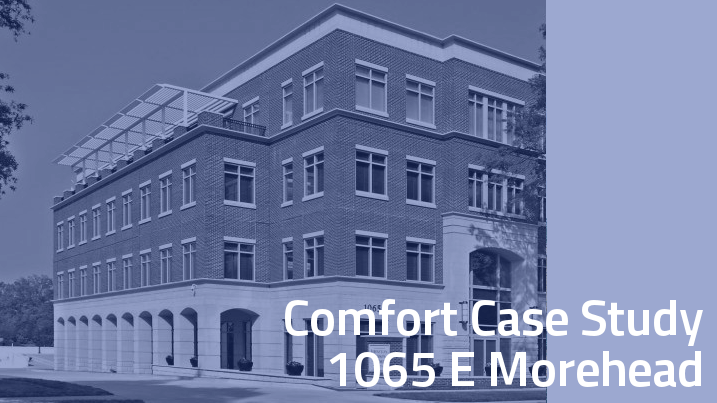 The property at 1065 East Morehead is home to a local and regional law firm. The on-site manager, responsible for far more than simply managing the equipment and occupant comfort, required assistance to provide maximum comfort to his colleagues, at a low cost and with a minimal time requirement. That’s where PointGuard came in. By employing custom algorithms, providing specific recommendations for improvement and expert monitoring by the PointGuard team, the property on East Morehead was able to decrease its energy usage by 37 percent and improve comfort for the building’s tenants. 1065 East Morehead was successful because they completed 100 percent of the recommendations in the first year of service, resulting in excellent comfort for the following years. The key to this success was PointGuard’s ability to identify which equipment or controls settings needed adjustment. A prime example is the Supply Air Temperature Reset , which automatically adjusts delivery temperature to optimize comfort. PointGuard found and resolved several other critical items. These included identifying zones where primary air dampers were loose or stuck, thus not providing sufficient or providing excessive airflow; unusual indirect temperature settings that resulted in unhappy colleagues; and a design flaw where some exterior zones were not heated. Since PointGuard’s intervention, the property at 1065 East Morehead has had a near perfect Comfort Score, a measure of accuracy of the desired temperature, due to taking recommended strategic actions. This property leads by example, demonstrating that specialized monitoring and proactive action can lead to both happy tenants and huge energy savings. PointGuard’s technology and expert analysis provided the support needed for the site’s manager to accomplish more, with less effort.